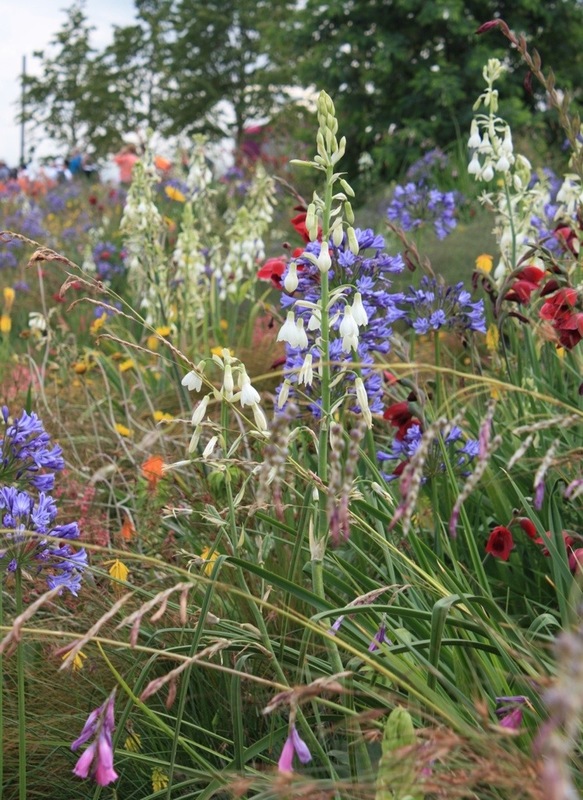 Visitors to the Olympic park via the bustling Stratford entrance were for two weeks greeted by the showiest of the London 2012 gardens, representing the Southern Hemisphere. To my mind these were among the most successful plantings, representing the British fascination with tender perennials dating back to the 19th century. Judging by the number of people taking photos and generally admiring the flowers, we’re no less in love with Agapanthus and red hot pokers than we were then. And the good news (?) is that our climate is slowly becoming more accommodating, allowing many to survive outside during the winter. The golden strawflowers (Helichrysum aureum) in the foreground of the photograph above are common South African plants and can be dried. Here they form a lower layer of planting between towering Gladioli, Dierama and Galtonia. 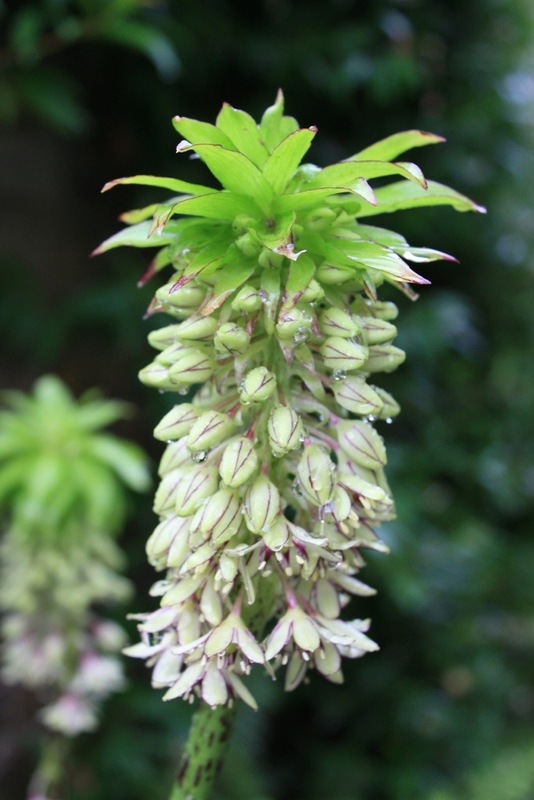 Also at this level are beautiful pineapple lilies (Eucomis bicolour), one of my favourite bulbs, although not doing too well for me this year. I have kept them in too much shade so the flowers are sparse and lacking the normally dark freckles. The photograph below was taken in our garden in 2010 after a spell of summer rain. 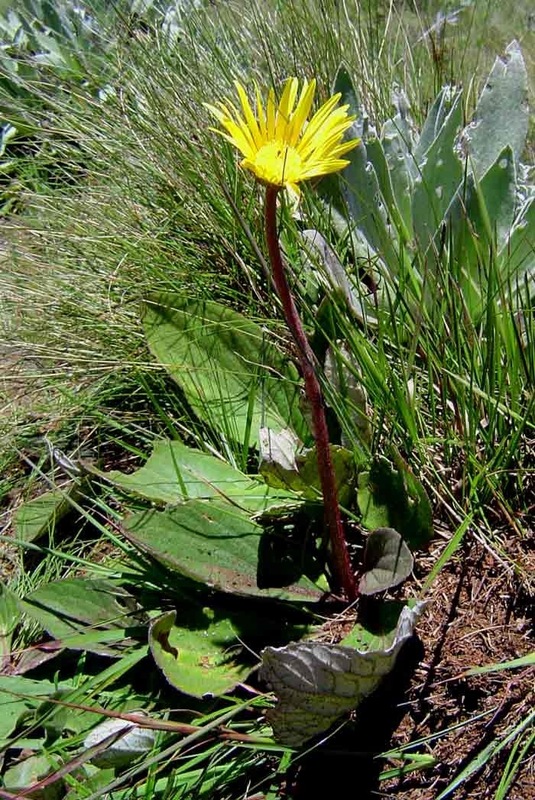 A new plant for me was the false gerbera (Haplocarpha scaposa), a fast growing perennial with densely hairy, slightly silvered leaves and bright yellow flowers (photo credit: Mark Hyde, Bart Wursten and Petra Ballings). This was planted alongside another fantasy plant of mine, the bugle lily (Watsonia pillansii). Both require more sun and space than I could possibly give them, so they will remain firmly on the “one day” list! 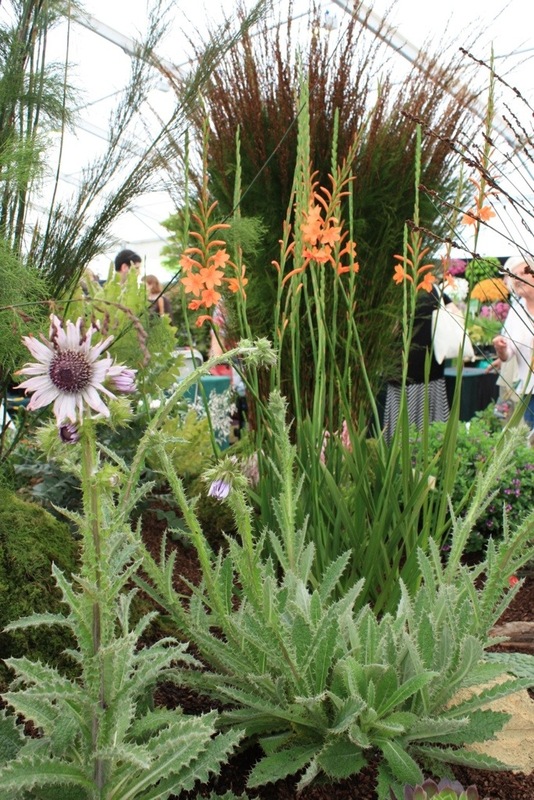 However, here’s a lovely display of Watsonia “Tresco Hybrids” in the heritage plant tent at this year’s Hampton Court flower show, accompanied by spiney Berkheya purpurea. 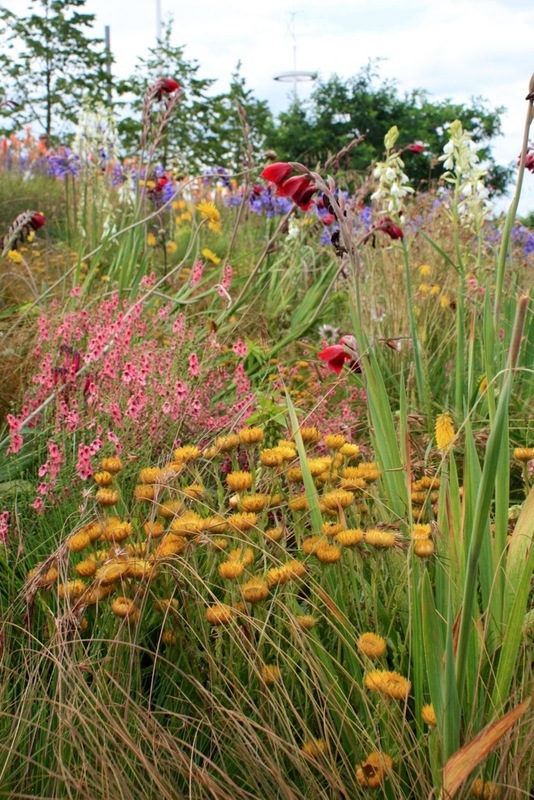 These colourful, highly textured plantings were at their colourful peak during the Olympics. It will be interesting to see how well they last for the Paralympics in 2 weeks’ time.